Muckish mountain, or simply Muckish as it is known by the locals (An Mhucais in Irish), was always a very special mountain. Since very early times it was regarded as ‘holy’ by the local tribes, well before the Christian period. The mountain is said to resemble a boar or pig when it is lying down. The Old Irish word muc means a 'pig' while the suffix ais is an ancient Pictish/Celtic ending associated with 'place'. It is easy to see why it would have been likened to a boar or pig. The boar was an ancient Celtic warrior symbol. The beautiful Muckish would have been visable on a daily basis to the Mag Fhionnaile/McGinley clan as well as others in the greater north Donegal area. Its appearance has not changed over the centuries and it is possible to imagine what our ancestors looked at each day. Beautiful views of Muckish can be got from Horn Head, a little to the north. Muckish rises to a height of 666 metres. It is the most northerly summit in the Derryveagh mountain range. The summit has a prehistoric cairn on it. All over the top are strange brick shaped rocks that look like they have been dropped from the sky. There is also a small igloo like structure and a few smaller cairns to see. Dominating the whole view is a large cross at one end of the mountain plateau. There are traditionally two routes to take to get to the top. 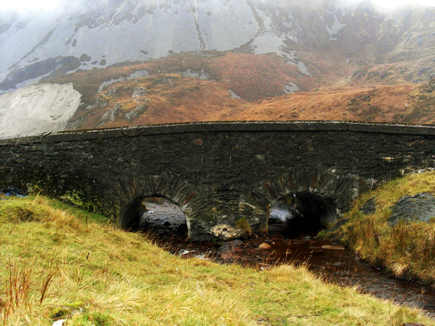 The first and easiest is located at 'The Bridge of Sorrows' at Muckish Gap to the south west of Muckish. The more difficult route can be found close to Creeslough village at the north eastern end. 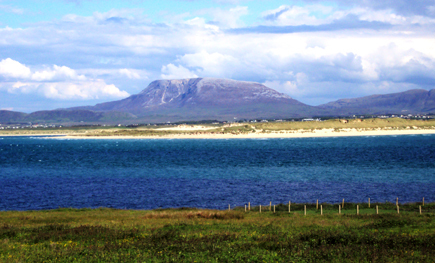 Muckish from Inishboffin Island, Co. Donegal. 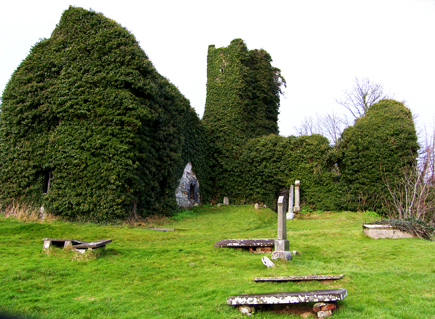 The ancient church at Tullaghobegly was the main place of worship for the people of the Tullaghobegly district and the wider Cloughaneely area up until the early seventeenth century. This was where our clan went for their worship. It is known, also, that people from the Gweedore area sometimes used this church too. Today all that is left is a ruin of a church and the old graveyard. The dead of much of north Donegal beyond the Muckish and Errigal mountains were buried here until Catholics were allowed to have new graveyards at Gortahork (1789) and at Magheragallon (1765). In the year 1610 the church was taken from the Irish and put into Protestant control. They used it as such until the roof collapsed in 1834. Even though the Protestants took over, Catholics were still allowed to bury their dead in the cemetry for years later. The adjacent graveyard is said to be the oldest in the north of Donegal. Today, the church ruin with the graveyard beside is to be found on slightly raised ground with a panoramic view of the surrounding areas. According to tradition, the Vikings landed at nearby Ballyness Bay and attacked the church at Tullaghobegly attempting to steal gold and relics. Their approach was noticed by the local people and a battle got under way in which the Vikings were defeated. The slain Vikings are said to have been buried at a spot near Rocktown called 'Reilig na Lochlainn' (Graveyard of the Viking). Bearing in mind that this occurance happened in known McGinley territory, it is possible that ancestors of the McGinleys took part in this battle. We say ancestors, because at this point in history the actual surname of McGinley had not been born! Beside the church can be seen a small mound that was used, according to local folklore, for the burial of unbaptised children. Alternatively, the mound may be a pre-Christian site. The ancient church situated at Ray was an important place of worship for the McGinleys and other local clans. There is a small mound close to the ancient graveyard. Tradition has it that this part was used for unbaptised children. This mound may have previously been a pre-Christian site of some importance. The church here used to be called St Fionnán's Church and tradition tells us that St Fionnán was the founder of the church sometime in the 6th century. The church at Ray, in ruins, dates to sometime before the late 1500's, the exact date is in doubt. Records show that it was still in use among the native people in 1609. It was built on the site of a much earlier church going back many centuries previously. Here we have an ancient stone cross called Cros Cholm Cille, or in English St Colm Cille's Cross. Tradition has it that this cross was cut out of a solid rock on the side of holy Muckish mountain either at Maamcross or Brocas. The cross measures 21 ft long by 7 ft wide. It fell during a terrible storm in 1750 and broke into three parts. Local tradition tells us that the cross was originally intended to be sighted on Tory island, but was presented to St Fionnán by St Colm Cille after Fionnán found the misplaced holy book of Colm Cille. However, experts date the cross a little later, to about the late 800's or early 900's. The cross has, in recent years been repaired and re-erected inside the church by the Irish Government. The low point in the history of this holy place was the destruction of the church and the massacre of the innocents by the English soldiers in the 1600's. This incident is heavily etched on the memory of the local people and is remembered as Marfach Ráithe - The Massacre of Ray. This is the place where one of our early ancestors, Ciothruadh Mag Fhionnghail, the noted monk and scribed, lived and worked during the year 1513 to 1514. He wrote various items for his patron Máire Mhic Shuibhne (the wife of the Clan Chief of the MacSweeneys of Fanad) including the Irish translation of the ‘Life of St Catherine of Alexandria’. It was Máire who had the Priory built. It was to be an important Carmelite House and a beacon of religious piety for the north west of Ireland. The present structure is in a ruined state (heavily covered in vines) in the heart of the village and is visited by many tourists each year. It was first founded around the year 1508 but wasnt finished until around 1516 (possibly even later). It was still in use in 1595 when we have record of the English leader George Bingham attacking this sacred place. He stole the treasured Communian Plate as well as other holy relics. After the Carmelites were kicked out, the Protestant Bishop Knox took over the Friary and started to renovated part of it to use as a private residence. The Rathmullan Carmelite Friary has an east window (chancel) with a presumed figure of St Patrick carved in stone above it. Near the holy mountain of Muckish in the district of Cloghaneely, there is a small ancient stone bridge that is known locally as ‘The Bridge of Tears’, from the Irish Gaelic Droichead na Caointe. It is located at what is known as Muckish Gap. It was the custom, from the start of the Plantation (1609) for departing family members to accompany their loved ones as far as this bridge and then say their goodbyes. The illegal Plantation of Ulster, instigated by the English Government, caused many families to fragment. Some left to start a new life elsewhere while many, usually the old or sick, would stay behind. Many McGinleys, and other north Donegal families, would have passed through this sad spot. Before the advent of the railway and the building of modern roads, this route through Muckish Gap was just about the only way to get to the south of Donegal and hence to Derry for transport abroad. It was in the nineteenth century that the bridge was most used as a ‘point of departure’. The Great Hunger caused thousands to leave their native lands never to return. This long walk to the bridge had all the finality of a funeral, as most would never see their loved ones again. The town of Derry was the destination for most. The port there could take them to England, Scotland, America and Australia. There is a stone memorial placed at the bridge, in Irish Gaelic. The English translation is as follows: "Friends and relations of the person emigrating would come this far. Here they parted. This is the Bridge of Tears". The world reknowned poet, writer and artist Percy French was painting around this area. He started up a conversation with an old woman, according to local lore she was called McGinley or McGonigle. Her children had all gone away and she remarked “T’ was a lonely land to live in when the children was away”. This sentence so captivated Percy that, on returning to his accommodation in nearby Falcarragh, that night he composed one of his most famous songs ‘The Irish Mother’. The world famous Donegal folk group Clannad new of the importance of this lonely bridge. It inspired them to record the piece called ‘The Bridge of Tears’. It can be found on their album ‘Landmarks’. Other places of interest to McGinleys are Glencolmcille. 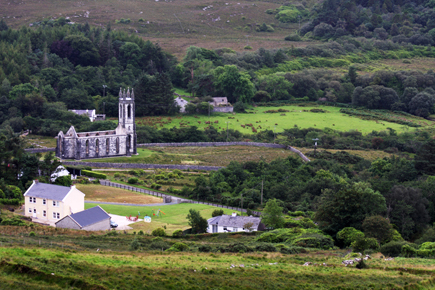 A beautiful valley in the south west of Donegal, named after St Colm Cille. Legends and devotions to him are widespread in the area. The area has many McGinleys living there since around 1604 when they were displaced from the north of the county. Also Templedouglas, near Letterkenny. Here is the site of a medieval church, where an earlier church once stood. This was the place where Colm Cille was baptised and educated by Cruithneachán. 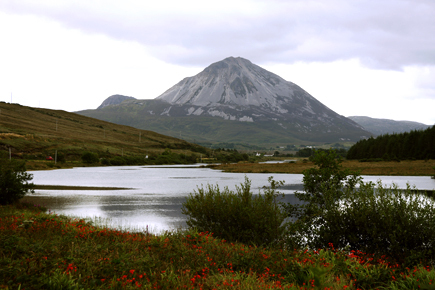 A popular tourist destination, Mount Errigal rises to a height of 751 metres and is found to the western end of the Derryveagh mountain range. Errigal is outwith the McGinley territory but can be seen from much of it. This great photograph is of The Poisoned Glen and Dunlewy. It was here that the monks of the monastery of St Colm Cille on Tory fled when they were attacked and pillaged by English soldiers in 1595. This was a desolate, remote place inhabited by wolves. The monks stayed here for a few years and their Order eventually died out. Some McGinleys may also have fled here for safety during 1603/4. This photograph shows the beauty of Donegal at sunset. The island in the distance is Inishboffin, a very popular tourist destination. There are many small islands dotted around the north and west Donegal coast. This is a very dramatic photograph showing the 'wildness' of Donegal at its best. A storm is approaching the headland at Bloody Foreland. The meaning of the area is not clear. There may have been a battle here in ancient times, hence the 'Bloody' part of the name. Some say it is named after the blood red sunsets which can often be seen around the area.